Softball is a sport which was derived as a variant from baseball. Invented in the United States of America in 1887, it has gained popularity and has become an often played sport with millions of fans from across the world. The use of softballs led to the game being named softball in 1926. However, the ball is not as soft as you would expect. Like any other sport, softball requires many gears to be able to play it well. And softball gloves are one of the important gears without which you would not be able to enjoy the game to the fullest. Without it, the great force at which the ball comes to your hand will be well felt. So, it is important for you to have picked up a great glove. With so many options available in the market for you to purchase, it can sometimes get overwhelming to choose the gloves which suit you the most. There is a need for you to research first and find out whichever glove would work well for you. 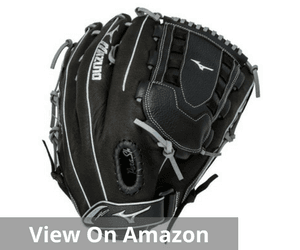 So, in this article, we have done the research for you and have come up with five of the best softball glove which can help you enjoy the game better. A soft and durable glove is what any softball player looks for. The glove should be able to endure the harshest of playing conditions while at the same time be not too hard for your arms. The right balance between durability and softness is the feature which makes a glove stand out among the rest. 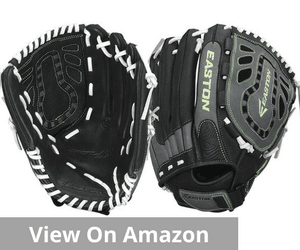 The Easton Salvo Elite Softball Glove is exactly that as it delivers the right blend of durability and softness. Made using steer hide leather, this glove is structurally comforting. 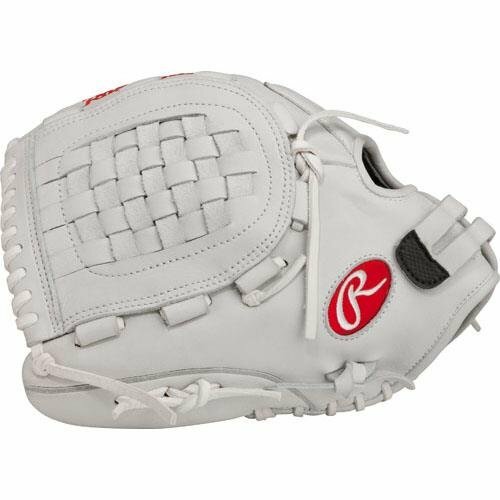 It features a Double Deep palm design, which gives the glove deep and wide pockets, making it easier to catch the ball. With a redesigned lockdown wrist strap, this glove is definitely not going to come off your hand once it is strapped down. It comes with a palm padding of VRS shock absorbing technology, which reduces the impact felt by you. Its flexibility is increased by the use of mesh inserts, and it also reduces the weight. 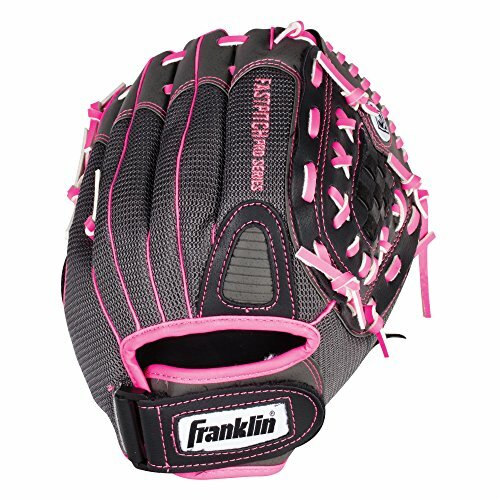 And it comes at a relatively small price which makes it one of the most affordable and value for money softball glove. Rawlings Liberty is one brand which delivers comfort, durability, and control in all their softball gloves. They have been churning out produced which is high performing without compromising on any other aspects of a good softball glove. It is known for its sizes which suits perfectly for women and have primarily been the best brand providing softball gloves for women. The durability comes from the full grain leather. It needs a minimal break in time as the company itself does 80% of the break-in before delivering it. It has all leather laces which enhances the durability. It comes primarily in a 12-inch model, but it also has a 12.5-inch model making it ideal for female infield player. The adjustable non-slip Liberty Advanced strap gives you the ability to customize the glove according to your needs. The glove is available for left and right handed throwers. The Index Finger Pad, when combined with the Paron XRD Palm, delivers a great combination which absorbs most of the sting of the ball making it easier to handle a fast incoming ball. It comes in white and red colors. Less break-in time as the company does 80% of it. Mizuno has come up with a great product when they released GMVP1200SE4 MVP Prime SE gloves. 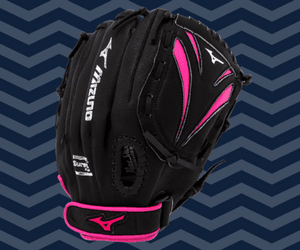 With a history dating back to 1906, Mizuno is one of the pioneers when it comes to softball glove manufacturing. They have had their fair share of amazing products, and the MVP series is one of them. Its design ensures the break-in period to be minimal as the glove is centered to the index finger due to its natural design. It has exceptional feel and comfort due to the use of bio soft leather which has a perfect balance of softness and oil. The use of heel flex technology has delivered the product with exceptional performance and flexibility. For a stable pinky and thumb, an ultra-slim palm liner is used. This model is available for left and right-hand throwers. The name Mizuno in itself is enough to ensure the quality and make of the product as they have never cut corners to make average products for a lower price. 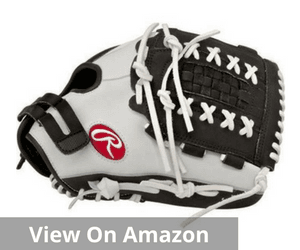 This glove is ideal for infield, outfield, and pitchers. At a reasonable price, you would not regret using this product. 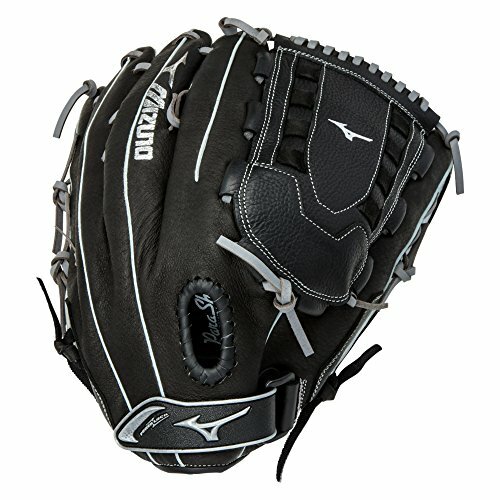 Mizuno makes a second appearance on the list with one of their most durable softball glove. 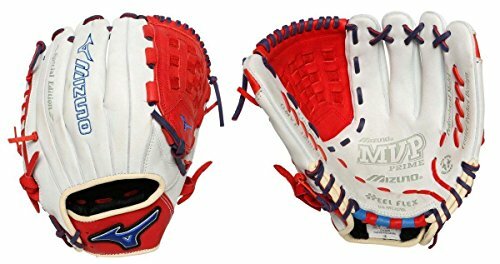 The Mizuno Premier Slowpitch or Fastpitch Softball Gloves have larger pockets, giving you the ability to handle the ball with ease. It is designed to deliver high performance and also last for many seasons. It is an investment for years as per the words of Mizuno. The mesh inserts make it lightweight, and the full grain leather gives it the sturdy feel. Better quality and feel is introduced to the glove with the use of ButterSoft Lining. Your hand is protected, and most of the shock is absorbed by the glove with the introduction of the Parashock Palm Pads. The patterns specifically designed for softball gives the glove an edge over the rest as one of the best for the price. It has adjustable fit with the use of Polyurethane PowerLock and also comes with a PU pull tab. The 13-inch model fits for most arms, and the adjustable feature only adds on to its usability. The Tartan U Web enhances the overall quality of the product. 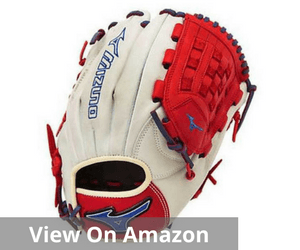 Franklin sports glove is said to be one of the best when it comes to youth players. It helps them learn a great deal through its use. It is a great example of a glove which blends quality and durability. With the adjustable wrist closure, mesh design, and laminated palm you get the best in this package. It comes in two different color variants which are much loved by any user. The glove is of the size of 11-inch which makes it ideal for players of the age of eight years or below. The glove is suitable for both left and right-hand throwers due to its unique design. Maximum protection and comfort are delivered by the glove through the soft PU lamination of the palm. 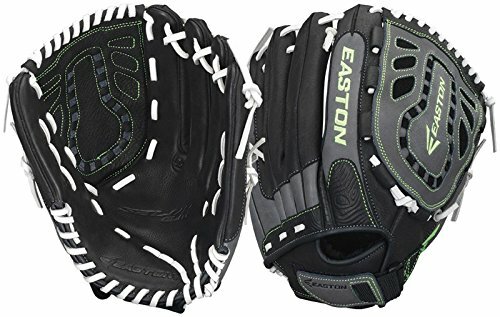 Reasonably priced, it is also a great glove for all the positions without mattering whether the player is in the pitch, infield or an outfield. The wrist closure makes the glove adjustable to any position to fit the wearer. This gives the ability got the glove to be used by multiple people without consideration of their palm size. It is available in two variants of pink/gray and lime/gray colors. Though there are only two variants, these colors are loved by most of its users. 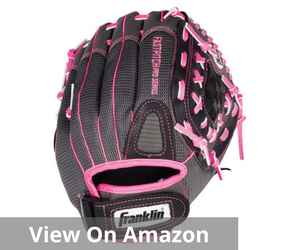 Buying a softball glove can be a tough task. You will have to take into account many aspects before the purchase. So here are the things you should keep in mind. There are different types of webbing available for softball glove depending on your comfort and the position you occupy in the field. From Basket web to I-web, Single Post web, modified trapeze web, Closed web and Dual post web, there are many options you can choose from. For example, looser stitch gives more control, so it is used mostly by pitchers to throw the ball effectively. The amount of padding required for the glove depends on personal preference and also the position a person plays in. For the catcher’s glove must have more padding as he/she will be catching the balls thrown by the pitcher. The padding of the player in the positions of first base and second base would also need more padding as the ball would come at them at great speeds. It has been a practice recently to have more padding for the glove for any position to enhance safety. The pocket size of the glove usually increases with their distance from the playing field. The outfielders have the deeper and wider pocket sizes as they would need it to catch the ball easily. The second baseman and shortstops have shallow pocket size as they need to get the ball out of the glove faster. Gloves are made of materials such as leather, grain leather, mesh and synthetic materials. The leather is the most preferred kind of glove due to its durability factor. Treated leather has a lower break-in period and professionals prefer it. Synthetic gloves are good for biggers who need inexpensive gloves. Mesh gloves are flexible and lightweight. This is the feature which lets you adjust the glove to fit your palm perfectly. Having this feature will help the player put in and take off the glove with relative ease. D-ring fastener, buckle system, velcro, and laced are used to make wrist adjustment features. The main factor which affects your purchase of softball gloves is your budget and requirements. Can you shell out a good amount of the purchase? If yes, you should look at gloves which deliver a lot more features. Are you a professional in need of a specific kind of glove? If yes, you have to take a look at all the features offered by the specific glove. At the end of the day, the purchase is dependent on your requirements and the budget. A good look at this article will not only let you know some of the aspects you have to take into account before the purchase of a softball glove but also introduce you to some of the best softball gloves. So take into account all these factors and make your purchase.